Thirty-four years ago, none of us at Iran’s newspapers could have known about the evil forces lurking behind the Islamic Revolution’s promises of change. Only a few newspaper headlines become iconic, a story in their own right. The headline “Shah Raft“—”The Shah Has Left” in Farsi—is one of those. It was printed on the front page of Iran’s two main daily newspapers, Kayhan and Ettelaat, on Jan. 16, 1979, after Shah Mohammad Reza Pahlavi left Tehran for good. “Shah Raft” captured the victory of the Revolution. It encapsulated history in the making. It ran in bold Persian letters, in size 84 font, across the top of the page. Over a million copies were printed. In Iranian journalism circles, the headline has sparked years of debate: Who wrote it? Who picked it? How did it come about? This month marks 34 years since “Shah Raft” hit the press. I was a deputy editor at Kayhan at that time. Here is what I remember from the newsroom in Tehran that night. All day on Jan. 16, Kayhan’s offices had been packed, buzzing. We’d brought a television set to the newsroom to watch the departure of the shah. The reporter assigned to the story was glued to the television in anticipation. His sleeves were rolled up. He was ready to write. Another reporter was at the Tehran airport reporting live from a payphone. There were no cell phones in those days. I was responsible for talking to the reporter and relaying his minute-by-minute dispatches to the copy desk. The newsroom staff resembled a team of wandering spirits, proceeding from the television set, to the phone, to the editorial desk. 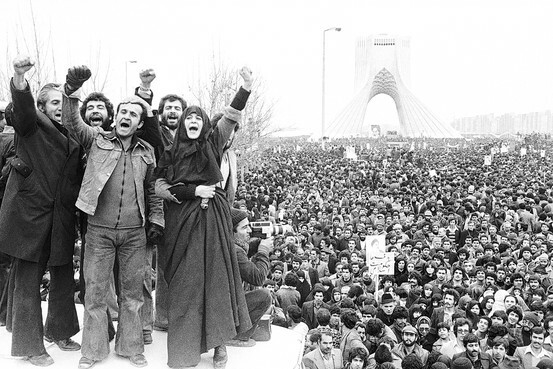 Associated Press An anti-shah demonstration on Jan. 19, 1979, in Tehran. In our morning editorial meeting that day, we had discussed how we would handle the headline if the shah really did leave Iran. Would we use the shah’s name with the singular or plural form of the verb “to leave”? In Persian, a plural verb is often used with a singular noun to suggest utmost respect for the subject. That settled it. Worried about the possible repercussions of our coverage, we agreed with Ettelaat to use the same font and to go to press at the same time. Safety in numbers. Still, our page designer was anxious. A political prisoner under the shah, he had dreamed of this day. He prepared the layout of “Shah Raft” in advance and kept it in his desk drawer. He paced around the newsroom, chain-smoking, sometimes walking over to my desk to put his hands on my shoulders. His eyes sparkled. None of us knew then what we know now: that publishing the headline “Shah Raft” would spell the end of our careers. None of us knew that most of us would end up in jail, tortured and interrogated. We could have never known that out of 110 newsroom staff present that day, only one person would still be working at Kayhan today. I couldn’t believe it. “Did you see with your own eyes?” I asked. The newsroom erupted with joy. When Kayhan and Ettelaat hit the newsstands with identical front pages, splashed with “Shah Raft” above the fold, a nationwide celebration followed. People held up the papers and danced in the streets. The two managing editors who oversaw the news that day eventually coordinated for another historic headline: “Imam Amad” (“The Imam Has Come”) for the return of Ayatollah Ruhollah Khomeini, the founding father of the Revolution, from Paris. But the Islamic Revolution, which vowed to root out brutal dictatorship and usher in an era of justice and freedom, did not honor its promises. A systematic attack on Kayhan began almost immediately after the shah’s departure, with demonstrations outside our office and threats made against us. Within three months, nearly all of Kayhan’s news staff, among the best in the country, were fired. Rahman, the editor-in-chief, died while being tortured in prison. Another editor, Gholamhussein Salehyar, was banned from journalism and died alone at home, in isolation. And the rest? Most of us who reported, wrote and documented “Shah Raft” and “Imam Amad” became unemployed, exiled and nomadic. When a notorious interrogator was appointed top editor at Kayhan a few years after the Revolution, we journalists became ice-cream sellers and shopkeepers. Many of us left the country. I wish we had known when we printed “Shah Raft” that an evil force was lurking behind our newsroom door, ready to crush the promise of change. Thirty-four years ago, neither I nor Rahman nor Gholam, nor anyone in the newsroom that evening, could have foreseen what is happening in Iran today. We expected freedom and got a religious dictatorship instead. Mr. Asadi is an Iranian journalist living in France. He is the winner of the 2011 Human Rights Book Award for “Letters to My Torturer: Love, Revolution, and Imprisonment in Iran.” He spent time imprisoned in Iran both before and after the 1979 revolution.